Content libraries are container objects for VM templates, vApp templates, and other types of files. vSphere administrators can use the templates in the library to deploy virtual machines and vApps in the vSphere inventory. Sharing templates and files across multiple vCenter Server instances in same or different locations brings out consistency, compliance, efficiency, and automation in deploying workloads at scale. A content library is managed from a single vCenter Server instance, but can be shared across multiple vCenter Server systems. Each VM template, vApp template, or another type of file in a library is a library item. An item can contain a single file or multiple files. In the case of VM and vApp templates, each item contains multiple files. For example, because an OVF template is a set of multiple files, when you upload an OVF template to the library, you actually upload all the files associated with the template (.ovf, .vmdk, and .mf), but in the vSphere Web Client you see listing only of the .ovf file in the content library. You can create two types of libraries: local or subscribed library. You use a local library to store items in a single vCenter Server instance. 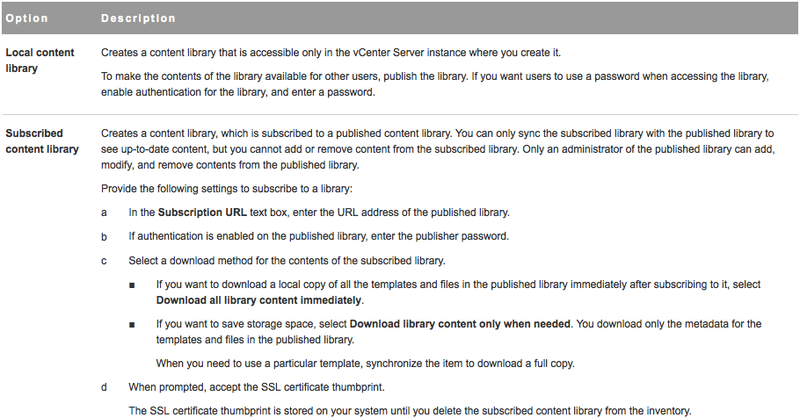 You can publish the local library so that users from other vCenter Server systems can subscribe to it. When you publish a content library externally, you can configure a password for authentication. VM templates and vApps templates are stored as OVF file formats in the content library. You can also upload other file types, such as ISO images, text files, and so on, in a content library. You subscribe to a published library by creating a subscribed library. The subscribed library can be created in the same vCenter Server instance where the published library is, or in a different vCenter Server system. When creating a subscribed library you have the option to download all the contents of the published library immediately after the subscribed library is created, or to download only metadata for the items from the published library. If you download only metadata for the items in a subscribed library, you save storage space. A subscribed library, which is set with the option to download all the content of the published library immediately, automatically synchronize with the published library on regular intervals to ensure the contents are up-to-date. You have to manually synchronize a subscribed library, which is set with the option to download contents from the published library only when needed. If you use a subscribed library, you can only utilize the content, but cannot contribute with content. Only the administrator of the published library manages the templates and files. Source Objects to Which You Can Subscribe By Creating a Subscribed Library in The vSphere Web Client. Libraries store content on a file system or a datastore. To ensure optimal performance, use file systems for libraries that are published, and use datastores for local and subscribed libraries. You can create a content library in the vSphere Web Client, and populate it with templates, which you can use to deploy virtual machines or vApps in your virtual environment. Required privileges: Content library. Create local library or Content library. Create subscribed library on the vCenter Server instance where you want to create the library. 1. In the vSphere Web Client navigator, select vCenter Inventory Lists > Content Libraries. 2. Click the Objects tab. 3. Click the Create a New Library icon ( ). 4. Enter a name for the content library, and in the Notes text box, enter a description for the library, and click Next. 5. Select the type of content library you want to create. 7. Enter the path to a storage location where to keep the contents of this library. 8. Review the information on the Ready to Complete page, and click Finish. To ensure that your subscribed library displays the latest content of the published library, you can manually initiate a synchronization task. You can also have subscribed libraries automatically synchronize with the content of the published library. To enable automatic synchronization of the subscribed library, select the option to Enable automatic synchronization with the external library in the subscribed library settings. Take into account that the automatic synchronization requires a lot of storage space, because you download full copies of all the items in the published library. Required privilege: Content library. Sync subscribed library on the library. 2. Right-click a subscribed library from the list and select Synchronize Library. A new task for synchronizing the subscribed library appears in the Recent Tasks pane. After the task is complete, you can see the updated list with library items in the Related Objects tab under Templates and Other Types. You can change the settings of a content library. As an administrator of a content library, you can publish a local library from your vCenter Server instance to share its contents across multiple vCenter Server systems. From the Edit Setting dialog box, you can obtain the URL of your library and send it to other users to subscribe. If the library is already published, you can change its password for authentication. Users who are subscribed to your library must update the password to keep access to the published library. Required privileges: Content library. Update library and Content library. Update local library on the library. 2. Right-click a content library and select Edit Settings. 3. Edit the settings for the library. You can edit the settings of a subscribed library to optimize storage space and network bandwidth by switching between the options to download content from the published library. You might also need to update the password for authentication to the library if the administrator of the published library changes the password. Required privileges: Content library. Update subscribed library and Content library. Probe subscription information on the subscribed library. 2. Right-click a subscribed library and select Edit Settings. 3. Edit the settings of the subscribed library. ■ Enable or disable the automatic synchronization with the published library. ■ Update the password for authentication to the published library. ■ Select a download method. You can either download all library content immediately or download library content only when needed. If you switch from the option to download content only when needed to the option to immediately download all library content, after confirming the dialog a synchronization task starts and content starts to download. The number and size of items in the published library determine the amount of time and network bandwidth that the task requires. You can delete a content library that you no longer want to use. Required privilege: Content library. Delete subscribed library or Content library. Delete local library on the type of library you want to delete. 2. Right-click a content library from the list and select Delete. 3. In the Delete library confirmation dialog box, click Yes. The content library and all its contents are deleted. vSphere objects inherit permissions from a parent object in the hierarchy. 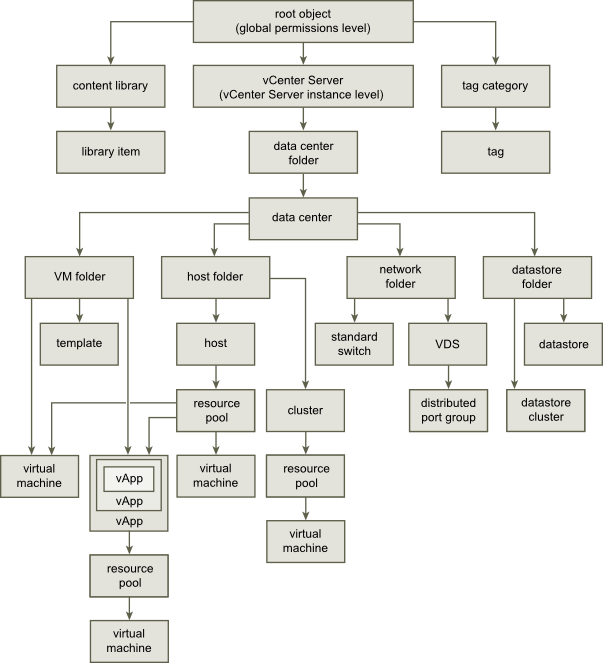 Content libraries work in the context of a single vCenter Server instance. However, content libraries are not direct children of a vCenter Server system from an inventory perspective. The figure illustrates the inventory hierarchy and the paths by which permissions can propagate. For example, a user has an Administrator role that is defined at a vCenter Server level. When the Administrator navigates to Content Libraries in the object navigator, he sees 0 libraries despite there are existing libraries in the vSphere inventory of that vCenter Server instance. To see the libraries, the Administrator needs a Read-Only role assigned as a global permission. Administrators whose role is defined as a global permissions can see and manage the libraries in all vCenter Server instances that belong to the global root. Because content libraries and their children items inherit permissions only from the global root object, when you navigate to a library or a library item and click Manage tab, you can see there is no Permissions tab. An Administrator cannot assign individual permissions on different libraries or different items within a library. vSphere Web Client provides a sample role that lets you be an administrator of content libraries. You can modify the role or use it as an example to create custom roles for specific tasks you want to allow other users to perform. Content Library Administrator role is a predefined role that gives a user privileges to monitor and manage a library and its contents. ■ Create, edit, and delete local or subscribed libraries. ■ Synchronize a subscribed library and synchronize items in a subscribed library. ■ View the item types supported by the library. ■ Configure the global settings for the library. ■ Import items to a library.